Pain Awareness Month – There is hope. What is chronic pain. Chronic pain keeps coming, firing up the nervous system for weeks, months, even years. an individuals chronic pain can be the result of an injury at work, a car accident, or sports related injury. Common chronic pain complaints include low back pain, and nerve pain. Skyline Pain Medicine & Rehabilitation in New York is acknowledging September as “National Pain Awareness Month”. The message this month is specifically a time for anyone suffering chronic pain to take time to care for yourself. Skyline PMR acknowledges you, and your struggle with pain. 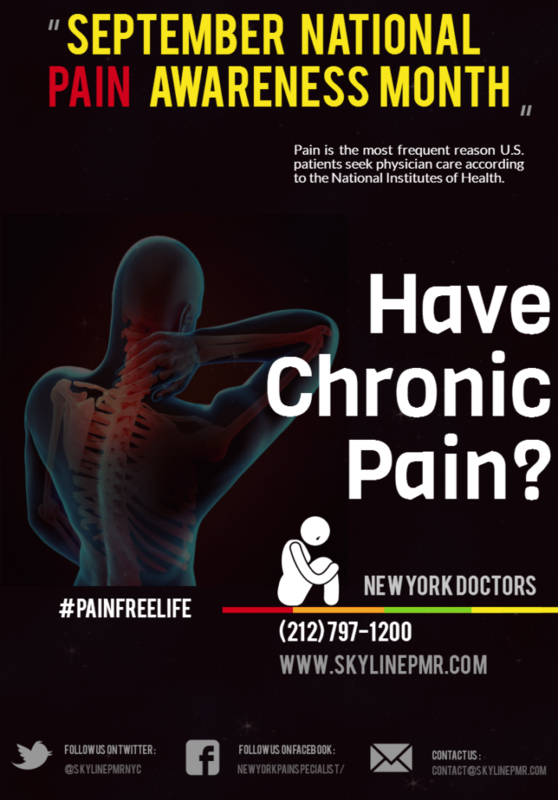 Skyline PMR located in the financial district provides pain management treatments and effective ways to cope with pain. You deserve a #painfreelife. Dr. Monfett and staff encourage you to take our hand figuratively speaking and trust that “WE ARE ON YOUR SIDE” you are not alone! We understand that pain happens, pain is not your fault, pain can drastically effect the equality of your life. Patients experiencing chronic pain deserve treatment. Pain patients are not addicts, they are hurting people who deserve to be treated as such with dignity. Top common pain conditions: low back pain, and neck pain. Back pain is the leading cause of disability in America. 50% of patients complain they had little or no control over their pain. 60% of patients say the pain severely impacts their quality of life and overall well-being daily. 59% reported an impact on their overall enjoyment of life. 70% said they have trouble focusing. 74% experienced a lack of energy due to pain. Knowledge is power and the doctors at Skyline Physical Medicine and Rehabilitation are dedicated to your healing. We are now accepting new patients and truly believe we ca make a difference in your life. What you’re doing to treat your pain? Ask About: PRP Therapy and Botox injections for pain.